Purchase Workbook Now - only $5! This 12 page workbook shares the canning equipment checklists for both water bath and steam canning gear, a canning season planner including a pantry list, an altitude adjustment guide, and tips for getting ready for canning season. Use the stovetop guide to help visualize what pot goes where, and what to do first when water bath canning. There's a canning log for tracking recipes you loved (and didn't!) and yields therein. The most valuable page may be the acid and canning guide, which lists the pH values of fruits, vegetables, and foods like vinegar that you might include in a canning jar so you can make safe substitutions when canning. Plus, you get a bonus recipe section with my best loved recipes (Tomato Jam & Strawberry Jam) with complete instructions for water bath or steam canners. Grab this super valuable guide today! "What a steal! So much good information in there!" "Thanks for the great lesson...it was super fun and you made it all seem so easy!" 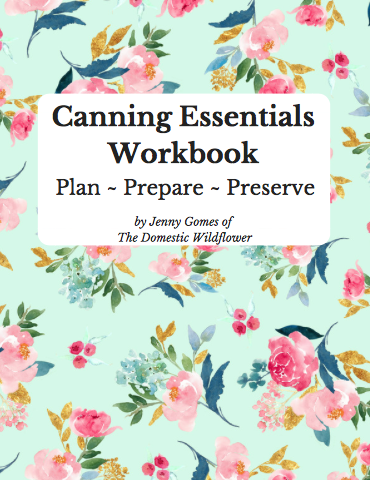 Want to take a peek inside the Canning Essentials Workbook? Watch this. I'm a busy mom of two, an English professor, and I LOVE canning. In fact, canning has helped me as a mom more than anything else to get healthy dinner on the table fast. Forget meal planning- I have jar-planning! I want to help YOU learn how to save time, prepare healthy homemade food in jars quickly and easily, and see that canning has come a LONG way since our grandmas did it! "...such creative ideas about keeping food and such great recipes! This definitely isn't your traditional "canning" thread." "You ladies would love following @thedomesticwildflower - she truly is the queen of canning and has fantastic canning recipes!" "This lady is awesome! She teaches how to can everything from cherries to any kind of delicious shrub!"